The Kawahara Lab’s research has been featured in various media articles and documentaries, which helps to give the general public a better understanding of what our research entails. For links to specific news articles, please visit the Publications Page. While conducting fieldwork in Malaysian Borneo in 2014, the Kawahara Lab was filmed with collaborators, the Barber Lab, as part of a 3D David Attenborough documentary. The program discusses the evolution of flight throughout the animal kingdom. The Kawahara and Barber Labs’ research on bat-moth interactions was a part of this three-part documentary called “Conquest of the Skies”. An area of interest has been to educate the American public about entomology. Insects are adored in Japan, and often kept as pets in people’s homes. Insects are sold as pets in Japanese department stores, and some beetle pets have sold for more than $90,000. There are also video games that are based on insects. Some are on fighting stag beetles, and others are on collecting insects and studying them. 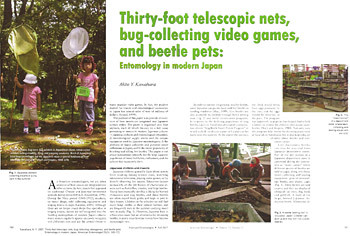 In order to get the word out to the American public, we have published papers on insect collecting and natural history education (e.g., Kawahara, 2007; Thirty-foot telescopic nets, bug-collecting video games, and beetle pets: entomology in modern Japan. American Entomologist 53(3): 160-172). The paper was based on a talk that was given at the Smithsonian Institution, University of Alberta, University of Maryland, and the ESA annual meeting. The talk focuses on how we need to change the misconceptions made by the public that frequently surround insects. With a goal to change such beliefs in our country, we teamed with film director Jessica Oreck in New York and co-produced a documentary called Beetle Queen Conquers Tokyo. The film debuted at the South by Southwest film festival in Austin, Texas, won the prestigious Special Documentary Prize at the Cinevegas film festival in Las Vegas, and the Cinema Eye Spotlight Award in New York City. For a YouTube trailer of the film click here. Our lab also conducts citizen science projects to include local residents in our research. Click here for details on current citizen science projects.